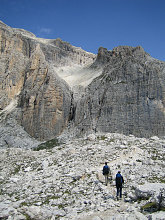 A short, busy route with excellent sella group scenery and with a nice big ladder section. I'd call this one moderately easy in terms of difficulty, and relatively easy in terms of absolute physical effort (this, of course, assumes the use of the 2-stage cablecar from Corvara. To do this route as we did it (because there are certainly other trails you could take to get to the start of the ferrata), park at the cablecar station in Corvara and take the cablecar all the way up to topmost chairlift station. You get dropped off not far below the starting elevation for the ferrata - this is why this route is not so strenuous physically. If you had to hike it all the way up from the town, then it would be a long and tiring day. Once the lift drops you off at the top station, you can stop for a second and observe the route ahead. Above, and to your right, the ferrata scales the big cliffs that you see. The trail that you want, therefore, also wanders off to the right, initially undulating, but then starting to climb, eventually reaching a junction where you want to turn left towards the ferrata piz da lech. 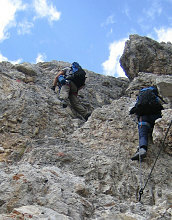 You'll then reach the start of the ferrata in just a few minutes. Total time from the top lift station to this point is about 20 minutes. The protection is good and the exposure is only moderate. This is a nice place to practice "true" climbing (i.e. not holding on to the wire while climbing). The rock is especially nice and solid and has lots of good holds. After a litle while of pleasant climbing, you'll see the big ladder sections. When we were there, it was jam-packed with a ton of people, and we had to wait our time. The ladders aren't particularly hard, of course, but some of them have slightly awkward and airy exits at the tops. Not long above the ladder sections, the ferrata ends completely (this is not a long ferrata). From here, it is a moderate mountain walk up a well-defined trail to the summit of Piz da Lech. As you approach the summit, you are presented with a wonderful panoramic view of the gorges and towers of the interior of the Sella group, which up until now have been hidden from you. After you've had your fill of the Piz da Lech summit, start heading down via the 'regular' route. 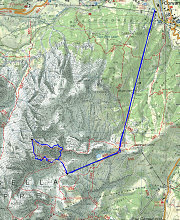 This means heading down pretty much straight east from the summit on the waymarked path 646. It is mostly an easy trail descent, with a couple of very easy protected cliffy sections. After finishing the final easy ladder on the descent from Piz da Lech, turn right (south) at a nice grassy flat and head back to the trail which leads to the top of the lift, and catch your ride back down. Pretty quick and easy, all told.